I have just finished reading the book “Pro C# 2008 and the .NET 3.5 Platform,” (by Andrew Troelsen, 1370 pages) showed in the picture besides. Having finished it is cause of great joy for me, given that this heavy book has accompanied me for the last 7 months! This great amount of time is understandable for a book with 1370 pages. It is huge! Definitely, the biggest individual book I have ever read. What most surprise myself is the fact that the biggest book I read is a book in Computer Science! 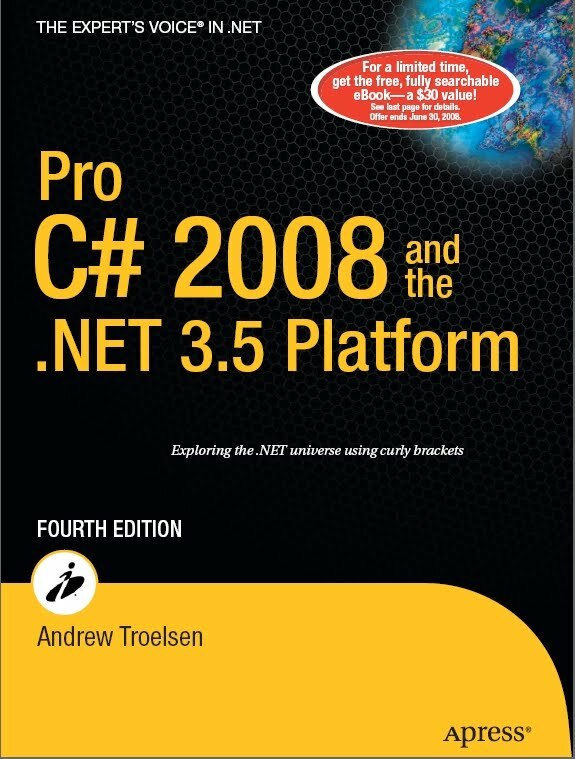 More specifically, a book about a programming language (C#) and its development platform (.NET). It’s surprising because, although I have read many big books in my life, almost none of them was in Computing. Some of the big books I read were technical, but none in my field of work (I am a Computer Engineer, by graduation). For quick examples, I can mention having read in the recent years books like “Diplomacy” (by Henry Kissinger, 912 pages), “Principles of Economics” (by Gregory Mankiw, 852 pages) and “História do Brasil” (“History of Brazil,” by Boris Fausto, 660 pages). So, for me it is quite impressive having completed this reading, being that in Computing. And why this innovation? The quickest answer is that this is an attempt to improve my skills on my current job. For almost a year, I have been working as a Software Engineer, in which programming in C# for Windows environment is pretty much what I basically do. As I had not previous professional experience on these technologies, reading a book like this, I thought, would be a great way of improving my skills and productiveness. If this experience was worthwhile? For me, surely was. I had a chance to be exposed to several different topics in Computer Science, looked through the lens of this particular programming language (C#), development environment (.NET and Visual Studio) and operating system (Windows). So was interesting not only for this particular scenario but as a revision of general topics in programming as well. If I would repeat the experience, knowing from the beggining the real gain I would obtain at the end? Yes, again, since I learned pretty much what I was expecting to learn. If I would recommend a complete reading like this to other folks? It depends. The book is amazingly complete and well-written, so having this as consulting material is something I highly recommend. But reading it thoroughly like I did, I would suggest just for those who are in a situation similar to mine (newcomers to the territory who want to acquire a very complete big picture) or for those who want to get acquainted with programming techniques not involved in their day-to-day work (which was my case as well, like someone who works in stand-alone single-threaded applications but have interest in learning more about multi-threaded applications, as well as database and/or web-based programming). In any situation, it’s worthy pointing out that nothing can replace working experience. Even considering that the code examples in the book are extremely useful, just the act of creating new code really makes things more clear on the long-run. Foi o de certificação Java mas que também foi muito bem escrito. Agora preciso terminar uma lista de livros que comecei e não terminei.